A West Coast Demerara teacher is set to receive the Queen’s Young Leaders Award at Buckingham Palace, London, on June 26th. Marva Langevine, 25, will receive the Queen’s Young Leaders Award for the work she has been doing for the bereaved, sick and underprivileged children and families in Guyana, a press release from UK Charity Comic Relief stated. Langevine, along with 240 other young leaders, were selected following a competitive process which saw thousands of applicants from 53 Common-wealth countries. Langevine, in a statement, expressed her excitement over being among the chosen few. “I am beyond excited to set off to London for the Queen’s Young Leaders Programme! I extend my gratitude to Her Majesty the Queen and the amazing organising team for the invaluable support and networking opportunity through this prestigious programme. The experience has been revolutionary thus far and I am deeply moved by the increased support for the bereaved children in Guyana. 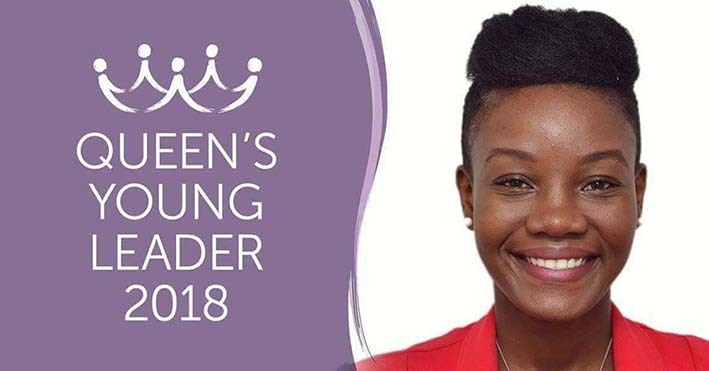 I am eager to meet my fellow Queen’s Young Leaders to grow and develop as a strong network committed to making a difference,” she was quoted as saying. According to the release, the awardees will take part in a year-long leadership course ran by the University of Cambridge. During their time in the United Kingdom, the awardees will take part in various classes and workshops, including a Masterclass at the BBC World Service and the UK Headquarters of Facebook. In addition, they will meet with the Commonwealth Secretary General and High Commissioners from across the Common-wealth. The Queen’s Young Leaders programme was established in 2014 by the Queen Elizabeth Diamond Jubilee Trust in Partnership with the University of Cambridge’s Institute of Continuing Education, the Royal Commonwealth Society and Comic Relief. Dr Astrid Bonfield CBE, Chief Executive of the Queen Elizabeth Diamond Jubilee Trust said: “Through selfless determination, the Queen’s Young Leaders of 2018 are dedicating their lives to bring positive change to those around them. Their visit to the UK this June provides them with a unique opportunity to connect with each other and gain valuable lessons from experts and leaders from all walks of life, which we hope will transform the reach of their endeavours for many years to come”. “I am delighted that the work they are undertaking is being recognized by Her Majesty the Queen and I look forward to meeting this year’s winners and celebrating the remarkable difference that they have already made all over the Common-wealth. Now that we are in the fourth and final year of this special programme, we look proudly on the network that is the Queen’s Young Leaders and feel confident that the future will be driven by their courage and commitment towards making the world a better place,” Bonfield stated.